This colour might look bold but I love it! 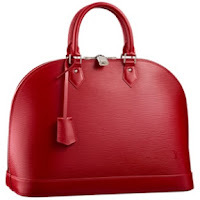 It's in Carmine Red from Fall 2012 Collection. So here is another bag that I have put in my wish for over a year already (because it looks really good for special occasions and events). I know Prada has this design too but this design has been with LV longer and its one of their classic bags (other than Speedy). I believe the LV Epi Alma in PM is my preferred size and will suit my body best! ;) I do not want it to be really big or really small since I might still need to carry Baby Iqbal's stuffs in it. Do you have this bag in your wishlist? Price wise, LV Epi Alma bag is definitely cheaper than Lady Dior and Chanel Classic Flap bags, but more expensive than Longchamp, Michael Kors and Coach. :P I'd say still achievable ;) What do you think?